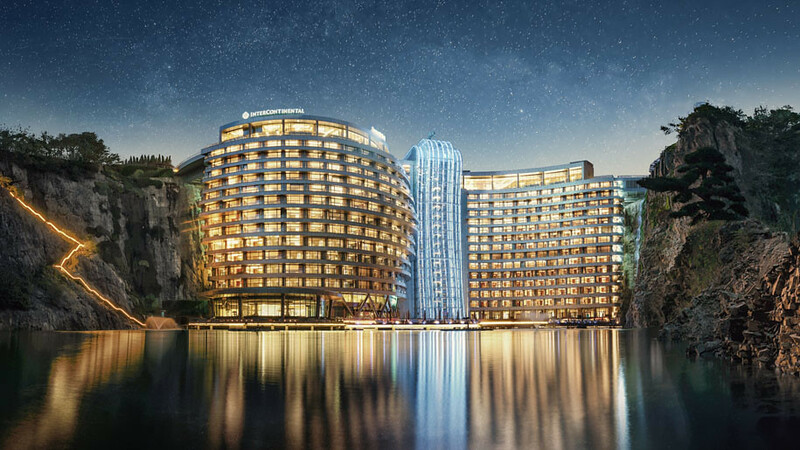 The new Intercontinental Shanghai Wonderland hotel has officially opened its doors, capping off a development process that has taken 10 years and an estimated US$500 million to complete. Built into the side wall of a former quarry in the Sheshan Mountain Range in south-western Shanghai about 30 minutes by car from Hongqiao Airport, all but two floors – approximately 88 metres – of the 18-storey building are technically below ground level, with two even being located underwater. This, fortunately, means that all 336 of the hotel’s rooms and suites offer rather impressive views of the waterfalls and surrounding cliffs. Guestrooms are divided into three categories – Classic Rooms, Executive Rooms and Suites. There is even an underwater loft that spans two levels, with a landing deck at water level, featuring an outdoor terrace and living room, and bedrooms located below the water encased within an aquarium. Hotel rooms that are located on the bottom floor of the hotel are also all afforded around-the-clock butler service. Also located just above water level is the hotel’s Club Intercontinental lounge, which serves as a social and meeting venue and also offers various exclusive services and benefits to eligible guests. On the food and beverage front, the hotel offers four dining venues. Cai Feng Lou is the hotel’s signature Chinese restaurant offering cuisine from Zhejiang and Guangdong provinces; Mr Fisher is a specialty seafood restaurant aptly located one floor below water with views of sea life in the hotel’s custom-built aquarium through the windows; and The Quarry is the hotel’s bar focusing in particular on premium Scotch whisky. Tea, coffee, snacks and other cocktails are also available at the She Shan Lounge in the hotel’s lobby. The new Shanghai hotel is the 200th property under the Intercontinental Hotels Group’s (IHG) flagship Intercontinental brand.